The BMW X3 is not the prettiest crossover to be really honest, and it can use good aftermarket kits. Here’s a good one by AC Schnitzer which apart from the body kit and styling bits, features nice set of wheels, performance upgrades for the four-cylinder (six-cylinders in the works), and interior tweaks. AC Schnitzer performance upgrade from 184 to 218 HP in the X3 xDrive20d is a nice touch of performance for the small SUV. 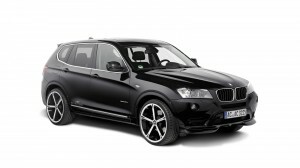 near future, the Aachen-based specialist will be offering a performance upgrade for the X3 xDrive30d too. So all the engines are covered. For the 6-cylinder petrol models 2.8i and 3.5i, an AC Schnitzer sports exhaust made of stainless steel is currently in development. This improves response and provides that special sonorous sound. The chromed “Racing” tailpipe trim sets the finishing touch to the exhaust system. For purely visual enhancement, this tailpipe trim is also available as a stand-alone accessory for diesel variants. The aerodynamic kit for the new X3 includes a striking front spoiler, the rear roof spoiler and the AC Schnitzer protective film for the rear skirt. The AC Schnitzer sports airbag steering wheel, currently in development, provides that sports car flair and safety in the interior. As well as the sports steering wheel, further unique “inner values” of the X3 by AC Schnitzer catch the eye. Sporting accents are set by the AC Schnitzer aluminium gear knobs in anodized silver/chrome or “Black Line“/chrome, or with digital gear display, and the “Black Line“ aluminium cover for the BMW-specific i-Drive system controller. Further impressive design elements such as the AC Schnitzer aluminium pedal set, an illuminated leather gear knob, and the AC Schnitzer velours foot mats, make the fully fitted X3 totally unmistakeable.